A blue plaque has been placed at the home of the former Cooper Car Company, marking its motoring heritage. 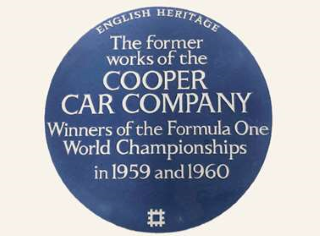 The Cooper Car Company, car manufacturer and winner of two Formula One World Championships, has today (16 August) been commemorated with an English Heritage blue plaque. The plaque was unveiled in Surbiton at the former Cooper Car Company works of the company’s golden years of the 1950s and 1960s, surrounded by vintage Cooper cars. Long before the Cooper make became known as Michael Caine’s getaway car of choice, the name was first associated with innovative and successful racing cars which saw the company win two consecutive Formula One World Championships in 1959 and 1960 and play a key part in the development of the modern Formula One car. It was from the improbable surroundings of Hollyfield Road in Surbiton that Charles Cooper, alongside his son John, created a company whose legacy as a leader in British motoring design would guarantee it a place in motoring history. At its peak, Cooper was the world’s largest production racing car manufacturer. The Australian-born Jack Brabham was at the wheel when the company won both the drivers’ and the constructors’ Formula One World Championships in 1959 and 1960, In 1958, Stirling Moss had won the Argentine Grand Prix in another Cooper car, and other famous drivers of Cooper racing models include Mike Hawthorn and Jackie Stewart. It was the swinging sixties that saw the launch of the Mini-Cooper, one of the most iconic British cars to this day. This collaboration between the Cooper Car Company and the mass market British Motor Corporation (BMC) saw this sporty, higher powered version of the Mini made at large BMC factories. However, the early rally driving Mini-Coopers were prototyped in Surbiton in the late 1950s, and racing Mini-Coopers went on to win the Monte Carlo rally three times. As an offering for the consumer market, the Mini-Cooper was launched in 1961 and quickly became ‘the first economy car to be an object of universal desire’; a firm favourite among celebrities such as George Harrison, Mick Jagger and even the great Italian driver and brand founder Enzo Ferrari. The famous getaway scene in The Italian Job (1969), which saw several Mini-Cooper cars speeding through the streets of Turin in Italy, further cemented the vehicle as a symbol of 1960s British popular culture.